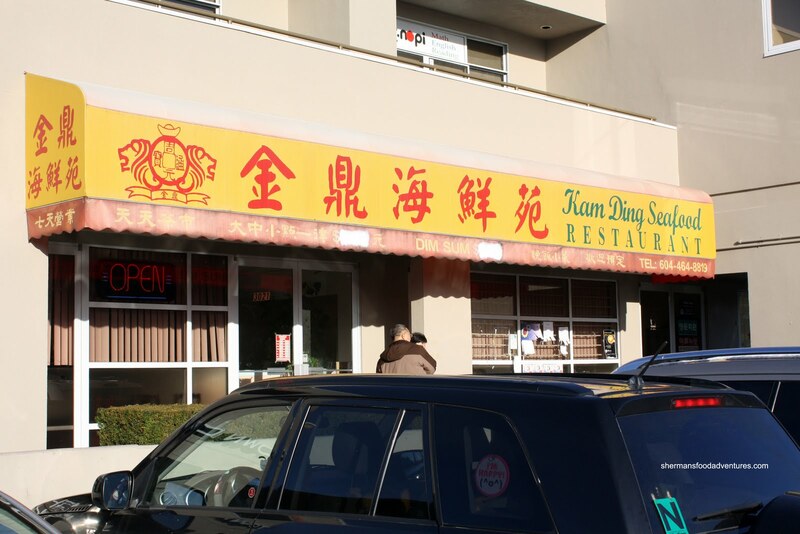 So off we headed over to Kam Ding for some Dim Sum at around noon. Alright, I know what you are thinking. "Are you crazy???" I do realize that is the prime time of Dim Sum and my chances of getting a table are as good as getting the last dumpling at a sampling station at T&T Supermarket. However, we gave it a shot. I dropped Viv off and she ran in to check how long we had to wait. Believe it or not, we got a table right away! Wow, I really can get that last dumpling after all... Right. Some old Asian lady would most likely shove me out of the way to get that last dumpling (especially if it were a shrimp dumpling). I should only continue hoping. Anyways, to my surprise, the place employs push carts. Talk about ol' skool. Not too many joints do this anymore. The benefit of push carts is that you can get your food right away. The negative is you end up filling the table too quickly with food and it all gets cold. Oh, and it makes it hard for me to keep up with the photos too! 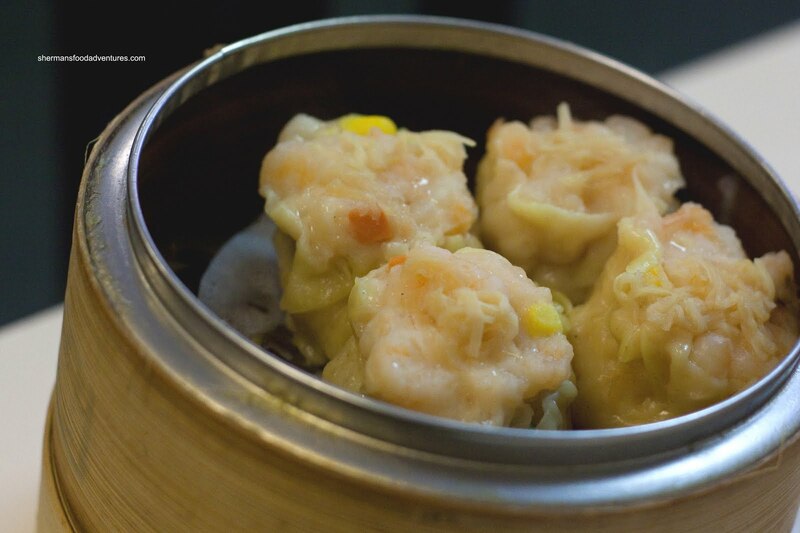 To start things off in a different direction, we ordered the Shrimp Sui Mai. 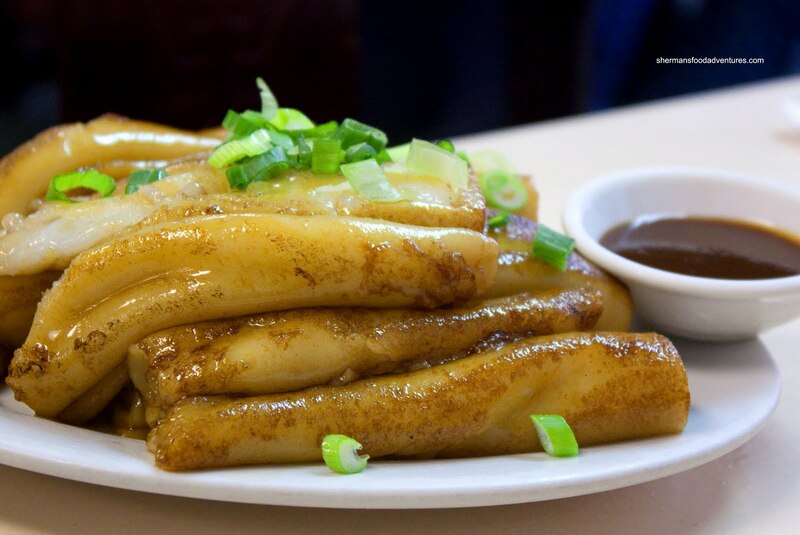 Normally, these dumplings are made with a combination of shrimp and pork. This version had a mix of shrimp mousse, corn, carrots and whole shrimp topped off with compoy. The result? Mushy. Nothing inherently wrong with the shrimp per se, it was sweet; but the chew and snap textures I normally look for in Sui Mai were not there. Chalk this up to personal preference. From one shrimp dumpling to another, we got the Scallop and Shrimp Dumpling. This was pretty good. They were large with a mix of shrimp mousse and whole shrimp with a scallop on top. The texture was much more appealing than the Sui Mai, having a nice resistance. This was probably a nice preview to the Haw Gow (Shrimp Dumpling). These suckers were absolutely huge. 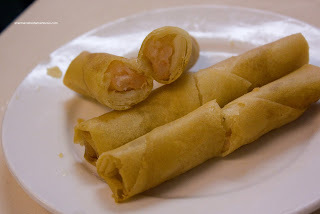 Once again, there was a mix of shrimp mousse and shrimp encased in a slig htly chewy wrapper. 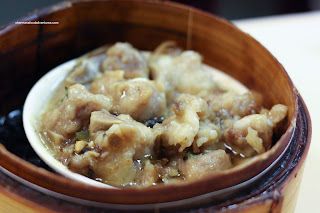 I thought the texture was fine, just like the previous dumpling; yet the flavour was predominantly sweet and not much else. Hey, that is not a big issue when the darn thing only costs $2.75! If that wasn't enough shrimp already, we got an order of the Shrimp Spring Rolls. There were actually 4 rolls; but my son was hungry and ate one already. I mean he ate the crunchy parts only and gave me the shrimp. Nothing particularly amiss with this. It was crunchy and there was whole shrimp inside. Now something that didn't have any shrimp - the Beef Meatballs. I'm sorry to say that these were too soft. Normally, the desired texture of the meat should be slightly bouncy. Basically soft while still having some chew. This one was bordering on mushy. Mushy balls, no good. Taste-wise, it was fine with a nice hint of dried orange peel. 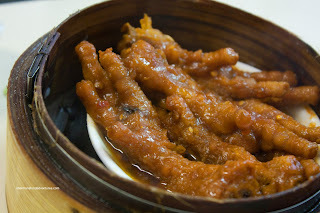 From balls off to Phoenix Talons or Chicken Feet. These were not bad, the skin was a tad loose and the sauce was a bit salty; yet nothing particularly wrong with it either. The mushiness started all over again with the Black Bean Spareribs. Completely over-tenderized, these had no texture whatsoever. One bite and the thing melted in my mouth. Good if it were chocolate, bad since it was pork (unless it was bacon dark chocolate... which Whipping Girl gave me - Yum!). I did like the flavour though, it was a good combination of black bean, garlic and dried orange peel once again. Now the my daughter was eating most of the dumplings while my son was merely eating spring roll wrapper. So we got an order of the Pan-Fried Soya Noodles for him. Neatly presented, these were pretty good. They were soft while still offering up some textural chew. I thought they were oily; but then again, they are always a bit oily. My son ate a whole bowl of these, so I guess they were more than acceptable. 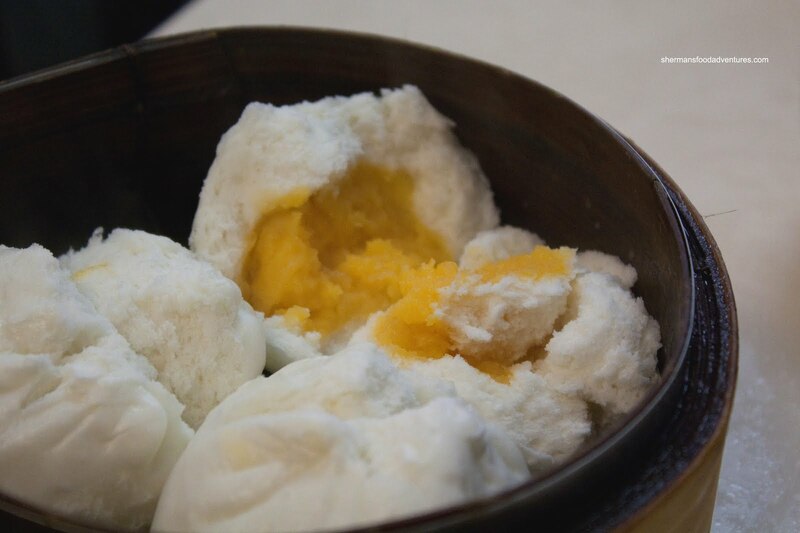 As for dessert, we got an order of the Steamed Custard Buns. Actually, we also got an order of the BBQ Pork Buns too; but I'm not including a photo because it looks exactly like the custard buns, just with different filling. The bun itself was quite good exhibiting softness without going mushy. I thought the BBQ pork was too sweet; however, the pork was quite good not being fatty. 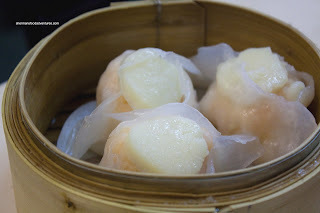 As for the custard bun, the filling was not too sweet and the texture was pleasing. My son ate a whole bun, so I guess that was good too. If anything pleases him, then it must be good! In terms of the Dim Sum at Kam Ding, I would say it is generally okay. Yet, there is really not much to complain about since all of the regular dishes are only $2.75 each. Furthermore, the portions are very good. Of course it cannot compare to Kirin and it doesn't try to. It is a good inexpensive alternative where friends can meet for some eats. With that being said, I think Rainbow Butterfly is better for the same price. 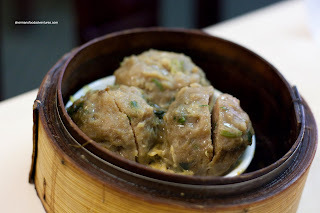 Oh, and I never made it out to T&T afterwards, so I didn't end up suffering dumpling theft. Nice review Sherman - pretty much hit it on the mark. Not a glamourous venue, but it's dim sum in the Tri-Cities! Gotta love the push carts too. Thank you for awesome posts all the time !! Ginseng, thanks for the tip! It's definitely decent for the price! Looks like they did a very nice job on the thinness of their noodle wrapping on the Haw Gow! 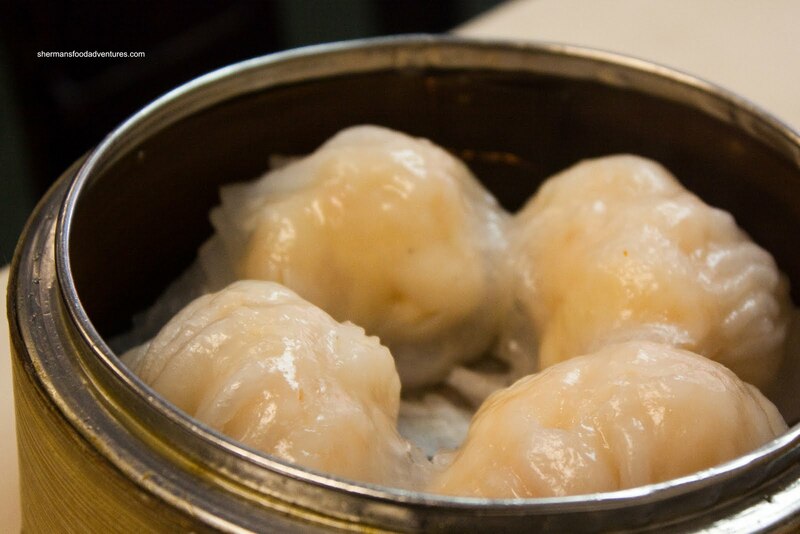 I <3 Push cart dim sum - so much more fun than ordering off a sheet! Elaine, the haw gow were enormous! Yes, push carts are so rare these days. Too bad eh?